The Globe Theatre Map shows that the Globe Theatre was situated on the Southbank of the river Thames in Southwark called Bankside - next to the Bear Garden. The picture of the Globe Theatre London Map was taken from an engraving by Claes Van Visscher of London, England, 1616. 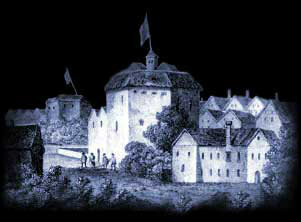 The Globe Theatre was the most magnificent theatre that London had ever seen. The Globe theatre could hold several thousand people! The Globe Theatre didn’t just show plays. It was also reputed to be a brothel and gambling house. Maps of London clearly show the architecture of the buildings, and these have enabled an approximate picture of the old theatre, such as the example picture at the top of the page, to be drawn. The picture of the map by Claes Van Visscher clearly shows the architecture and location of the old Globe Theatre and its close proximity to the Bear Garden ( later replaced by the Fortune Theatre). It had been assumed that the Globe Theatre had been an octagonal shaped building. This assumption was based on the illustrated Visscher map engraving of 1616. But recent archaeological evidence and other documents, such as the illustrated Hollar map, indicate that it was actually a 20-sided building. Other significant map views were the Hollar map - drawn circa 1640 by the Czech born engraver Wenceslaus Hollar. This Globe Theatre map depicts the re-built Globe and the Bear-baiting arena. The Agas features the Civitas Londonium map engraving which was printed in 1633 and associated with the name of Ralph Agas. It was based on a map produced by Braun and Hopenberg between 1554-1572 and features the bull and bear-bating arenas. The Norden - The Civitas Londini map engraving printed in 1600 based on drawings by John Norden which features the Rose Theatre , which was demolished in 1601, and the bear-bating arena. The following Globe Theatre Map dates back to the time of Shakespeare's London. Elizabethan Theatres in London were a booming business with considerable profits to be made. This Globe Theatre Map provides a good insight into the location of the famous Elizabethan theatres and the proximity between each other. Interesting Facts and information about the Globe Theatre Map. Additional details, facts and information about the Globe Theatre can be accessed via the Globe Theatre Sitemap.